I ended up getting asked to fish/mate on a 63 foot Bertram called Full Time. They were short handed with only the captain an mate for the last day of the Hang Em High Meat Tournament here in Hawks Nest Marina. I was amped to get back out on the water! The wind was blowing hard out of the SE at 20-25 knots, but SE is a favorable wind to fish here. It was pretty rough, but the fishing was on fire all day! We ended up whacking a lot of dolphin and 2 little wahoo in the first two hours. The best part was one of those dolphin was a big bull that we knew was a contender. 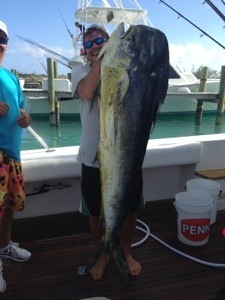 We ended up catching quite a few dolphin over 30 lbs and I caught my personal best, a 43 pounder. 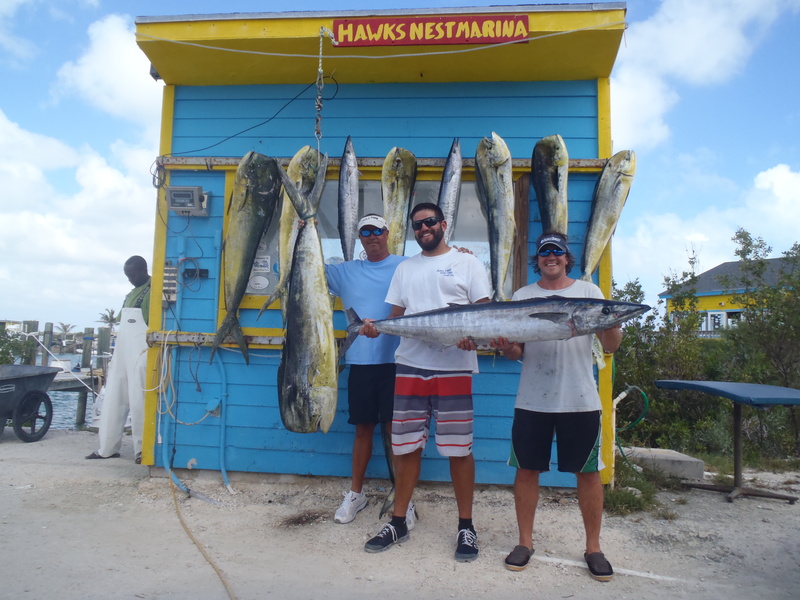 A little later we picked up a better wahoo that weighed in at 53 pounds and the bull dolphin ended up weighing a whopping 66 pounds. The big bull ate the old faithful blue/white Ilander Flasher with a horse ballyhoo and all of our wahoos ate a naked swimming mullet trolled behind a trolling weight to get it down. The dolphin ended up winning the whole tournament and the 53 pound wahoo helped pull together a hefty winning stringer for the tournament which consists of total weight of your biggest tuna, dolphin, and wahoo. It’s nice to be the lucky one! We even went 1/2 on white marlin. I’m looking forward to the 12 day stint we have coming up starting Friday. The Hawk’s Nest Staff did a great job making sure everything went smoothly for the tournament. It really seemed like everyone had a lot of fun!